Arrayed next to 2013's Haw and 2014's Lateness of Dancers, Heart Like a Levee proves that M.C. Taylor and his morphing cadre of supporting musicians are on an impressive roll. 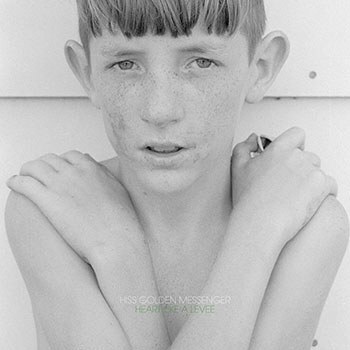 Hiss Golden Messenger, the vehicle for songwriter M.C. Taylor's back-porch mysticism, has long been associated with a noble strain of American Southernness. Hailing from North Carolina, he implants a vision of the Deep South in his songs. Yet the South he channels isn't a South of billowing Confederate flags, caricatured accents, and country-boy machismo; it's a South of antebellum ghosts, red clay, emptiness, complex Christian iconography and sonics that draw from folk-pop, roots rock, alt-country, white-man blues, and pew-shaking gospel. Listen to "Saturday Song" from 2014's exquisite Lateness of Dancers, and this South runs through your ears: here, Saturday is just as much a night of revelry, of exorcising the week's demons and kicking off its dust, as it is a prelude to Sunday's quiet sanctity. Deeper in Taylor's discography is 2013's Haw and its highlight "The Serpent Is Kind (Compared to Man)". You can feel the Appalachian earth slipping through his fingers as he sings a cautionary tale of man's inherent sinfulness. Now, with Heart Like a Levee, he chases his Southeastern muse even farther into his home territory. Perhaps not an improvement upon Lateness of Dancers, it shows Taylor's songwriting instincts firing on all cylinders; this is a record where the simplest Americana tropes -- twangs, thumps, strums, rasps -- seem to carry the gravity of a late night prayer. The record begins, fittingly, with a meditation beside the Mississippi Sound. Opening with an acoustic guitar that sounds like a bandaged wheel turning again for the first time, "Biloxi" is a concise rendering of everything that lifts Taylor's music above factory-line country: influences that ran the gamut from the Band's sepia-tone epics to Bonnie "Prince" Billy's world-weary poetry, crisp production, bursts of vocal rapture, and small moments of sublime lyrical intensity. Indeed, this is music that issues from the same hallowed imagination that Eudora Welty's fiction and the Allman Brothers' Brothers and Sisters (1973) emerged from, an imagination that turns the smallest details of Southern life -- the smell of morning air, open roads, small town triumphs -- into the stuff of spiritual exploration; to play this flippantly at the back of a crowded bar would seem imprudent. "It's hard, Lord / Lord, it's hard", he sings, not so much complaining as stating a cold, hard fact, before ushering the song to its close, "There's one way in and there's one way out / And we're gonna have a good time". This is a quintessential Southern maxim, and therefore a quintessential Taylor lyric: death is inevitable, as is its looming shadow, but let's make the most of our time here. Throughout Heart Like a Levee, we hear Taylor crafting micro-narratives like this that avow both the grime and glory of the Southern tradition. For the most part, he succeeds. While there are lyrical misfires ("I'm watching your dark legs / Flashing like some battlefield", for instance, from the swamp-funk stomp "Like a Mirror Loves a Hammer"), his battered-soul wisdom is mostly affecting, and his songwriting persona continuously reveals itself to be more and more authentic. He sings like a man who's been beaten down by life, left by lover after lover, who is, at times, ready to burst at the seams and, at other times, content with staring out at open skies. On "Heart Like a Levee", a stirring folk ballad that seems to break through the levee its title suggests, he calls out to some unseen interlocutor for mercy: "Sing me a river / Go easy on me, I'm not doing too well." Then, on "As the Crow Flies", this call is inverted; he becomes the savior rather than the saved. "Sing little bird / Sing for high summer", he urges his partner, a chorus of anonymous voices behind him, and as he repeats himself, as he continues to urge this partner to "sing", it becomes clear that the chorus itself is a fleeting taste of salvation. In each track, Taylor hints, singing may be the most powerful way to "have a good time" and confront death's shadow. Arrayed next to Haw and Lateness of Dancers, Heart Like a Levee proves that M.C. Taylor and his morphing cadre of supporting musicians are on an impressive roll. It's one of those records where even the "throwaway" cuts are miniature miracles of melody and composition. "Say It Like You Mean It" is a bright, rumbling blue-eyed soul rhapsody that is all hope and locomotive momentum. Even the lone instrumental "Smoky's Song" -- a tenuous wisp of melancholy and plaintive drones -- demands multiple listens. Each of these song conjures the Southeast in some subtle or explicit way, but it's not the ethos of the Southeast that makes Heart Like a Levee so captivating; it's Taylor's vision of it and how he lets it flood out of his music like water bursting through a reinforced dam.